There are twenty different types of amino acids that occur naturally in proteins. 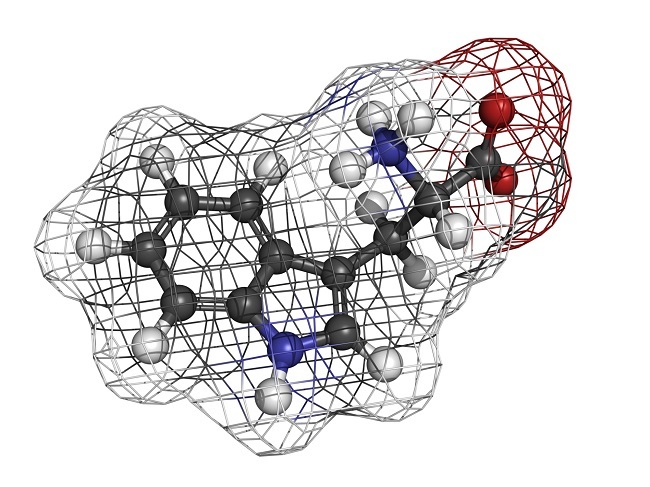 As a result, proteins display varying molecular structures, nutritional attributes and physiochemical properties. Food analysts are able to use a wide variety of analytical methods to determine type, total concentration and functional properties of proteins in foods. The Kjeldahl method is the quantitative determination of nitrogen in chemical substances. It was developed in 1883 by Danish chemist Johann Kjeldahl and is generally considered to be the standard method of determining protein concentration. The method consists of heating and decomposing an organic substance with sulphuric acid to liberate nitrogen as ammonium sulphate. The solution is then distilled with a small quantity of sodium hydroxide, which converts the ammonium sulphate to ammonia. The amount of ammonia (NH3) present is determined by back titration. While the universality, high precision and good reproducibility of the Kjeldahl method have made it the standard for the estimation of protein in foods, there are several disadvantages associated with the technique. Since all nitrogen in foods is not in the form of protein, the Kjeldahl method does not accurately measure the amount of true protein present in a sample. Although the conversion factor of 6.25 (equivalent to 0.16 g nitrogen per gram of protein) can be used for many applications, each protein must have a different conversion factor depending on its amino-acid composition. Furthermore, the use of concentrated sulfuric acid at high temperatures poses a considerable hazard, as does the use of some of the possible catalysts involved in the reaction. Finally, the technique is time consuming to carry-out. The enhanced Dumas method is an automated instrumental technique that is beginning to compete with the Kjeldahl method as the standard method of protein analysis due to its rapidness and ease of use. However, the Dumas method has high initial costs and an inability to give a measure of the true protein due to competing sources of nitrogen. CEM Corporation has developed the Sprint Rapid Protein Analyzer, which uses iTAG, an automated dye-binding method, to identify only protein, not nitrogen, in samples. SPRINT’s iTAG technology only tags the amino groups found in proteins. Fillers and other sources of non protein nitrogen (NPN) are simply ignored. Furthermore, SPRINT™ comes pre-programmed with a broad selection of iMethods™ ready for testing common products. You can easily create a method customized to your specific product type. With its truly innovative software, loading a method and analyzing samples on your SPRINT is no more complicated than finding a friend’s number on your cell phone. 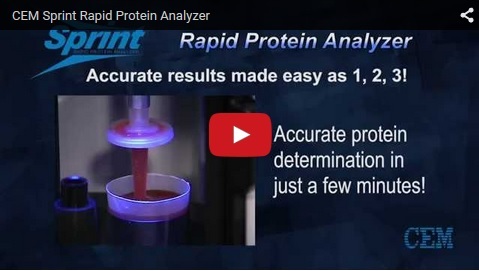 Click below to watch a video of the Sprint Rapid Protein Analyzer. Click here to learn more about the Sprint Rapid Protein Analyzer.